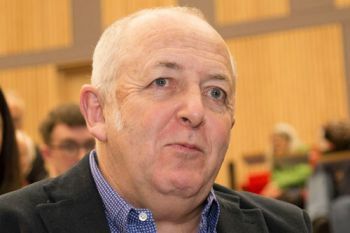 Jeremy Bowen, the BBC’s Middle East Editor, has been presented with the 2015 James Cameron Memorial Award at City University London. The Award is given in memory of prominent British journalist James Cameron, who died in 1985. It recognises distinguished foreign-affairs journalism by a British correspondent, whose work in the previous year had been "in the Cameron tradition". A seasoned war correspondent, Jeremy Bowen is currently one of the few journalists inside Syria reporting on the crisis. In February 2015, he spoke with President Bashar al-Assad about the on-going Syrian conflict during an exclusive BBC interview. He has reported from more than 70 countries since joining the BBC in 1984, covering conflicts in the Gulf, El Salvador, Lebanon, the West Bank, Afghanistan, Croatia, Bosnia, Chechnya, Somalia and Rwanda. In June 2005, he was appointed the BBC's first Middle East Editor with a brief to provide a broader perspective on the issues in the region and to add context to the reporting of events on the ground. In February 2011, Bowen became the first British journalist to interview Muammar Gaddafi since the outbreak of the Libyan civil war. “I tried to read this as a young, would-be journalist and it didn’t mean much to me then but looking at it again today, because of this auspicious occasion, I wanted to read one part which, for me in many ways, sums up a foreign correspondent’s uncertainty. “Cameron writes about finding himself ‘unanchored and adrift in the dark, gripping for clues as to where I am, sometimes indeed, even who I was. And this happens at the exact transition between sleep and awakening’. “I have had that experience so often”, Bowen explained. A posthumous Special Award was awarded to Sue Lloyd-Roberts CBE, which was collected by her daughter, Sarah. The television journalist, who reported from war zones and on human rights abuses around the world, died in October 2015 aged 64. In 2011, she was the first journalist into Homs - the so-called "capital of the Syrian revolution". She was appointed MBE and CBE for her humanitarian journalism, received the European Women of Achievement Award and won an Emmy for her reporting from North Korea. The Guardian’s obituary, written by Torin Douglas, described her work for ITN and the BBC as “fearless and resourceful”. It notes that “she travelled widely, reporting from war zones and exposing human rights abuses in some of the world’s most tyrannous and secretive regimes. Often she did so alone, filming her own reports and going to elaborate and daring lengths to get her stories”. The Special Award is given in memory of the late Eric Robbins. Previous recipients have included Marie Colvin, Paul Foot and Sir Charles Wheeler. Born in 1911, James Cameron was a leading figure in post-World War II British journalism and television. During his career, he reported on wars in Korea and Vietnam, the Chinese invasion of Tibet and the testing of nuclear weapons at the Pacific atoll of Bikini. His work in other fields - including his autobiography Point of Departure and his role as a founding member of the Campaign for Nuclear Disarmament - secured his reputation as a figure of journalistic integrity and authority. After Cameron’s death in 1985, a Trust was set up in his memory to award an annual prize to a journalist whose work in the previous year had been "in the Cameron tradition". Since it was established, the Cameron Award has recognised some of the UK’s leading foreign-affairs journalists including Michael Buerk, John Simpson, Bridget Kendall, Fergal Keane and Lindsey Hilsum. The recipient of the Award, which includes a prize of £500, is selected by a judging panel which includes George Alagiah, Michael Buerk and Stewart Purvis and is chaired by City Professor Howard Tumber.